The fee towards submission of application online and for the conduct of Examination is Rs. 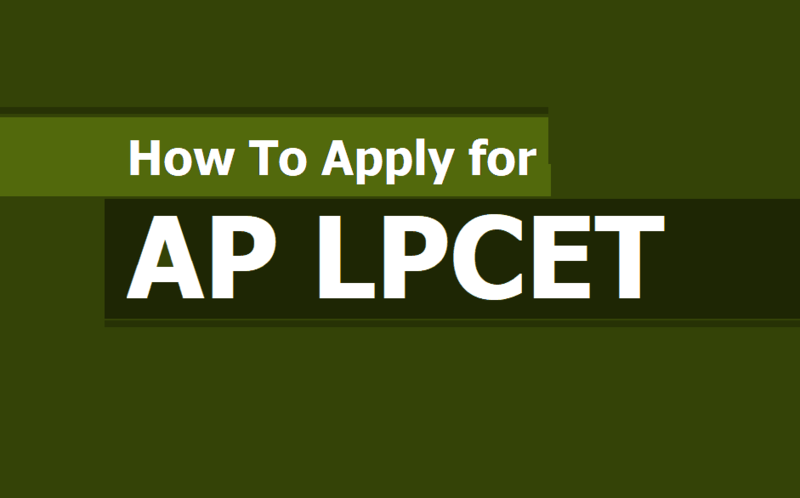 500- (Rupees Five hundred) per Candidates shall pay the fee through payment Gateway from 25-04-2019 to 18-05-2019 and submit online application at the AP LPCET website http://aplpcet.apcfss.in/. ii. The candidate after satisfying herself /himself about the eligibility criteria for AP LPCET shall pay a fee Rs. 500 /- through payment Gateway. for submission of application through online. On receipt of fee at ONLINE the candidate shall be issued a ‘Journal Number’ with which she/he can proceed with submission of application online. Issue of Journal Number does not mean that the candidate has completed submission of application online. It is only a confirmation of the fee received. iii The candidates shall follow the procedure of submission of online application as given in the ‘Information Bulletin’ and also as per the instructions provided online while filling up the online application form. The candidate should be ready with photograph of size 3.5x3.5 cms before filling in on-line application photo width=3.5 CM. iv. Paste the photograph on a white paper and sign below (sign in Black Ink only). Look for the sample above. Ensure that the signature is within the box. Scan the required size containing the photograph and signature. Please do not scan the complete page. The entire image consisting of photo along with signature is required to be scanned and stored in *.jpeg format on local machine. Ensure that the size of the scanned image is not more than 50kb. If the size of the image is more than 50 kb, then adjust the settings of the scanner such as dpi resolutions, number of colors during the process of scanning. a) Applications with no photo unclear photo/inadequate size photograph will be rejected. Hall – Ticket will not be issued to such candidates. Hence, after pressing the ‘UPLOAD’ button check if the photo is of required size, clear and is of the same candidate of whom the details are to be filled in the application. If the photo is smaller in size, not clear or does not belong to the candidate press ‘BACK’ button below the photograph on the application form and restart with scanning of the photograph. b) Complaints relating to mismatch of photograph and candidate details will not accepted after submission of application at any cost. c) After last date of receipt of applications no complaints (Name, DOB, Community, etc.,) shall be entertained under any circumstance. e) Enter your journal Number issued by ONLINE, the date of payment of fees and Date of birth. f) AT the field ‘Attach your latest photograph ‘Click on Browse button and attach your photograph and your signature stored on the local machine. i) The application will be opened. j) When the application form is opened check if the photo is of required size, clear and is of the same candidate of whom the details are to filled in the application. If the photo is Smaller in size, not clear or does not belong to the candidate press ‘BACK’ button below the photograph on the application form and restart with scanning of the photograph. k) Confirm that the photograph is yours and that it is as per the give specifications. l) Fill in the application form as per the instructions given in the User Guide and Information Bulletin those offered while filling the Online Application Form. EDIT and resubmit the information. o) On submission of application form online the candidate shall be given reference ID number which should be kept carefully for any kind of future correspondence. i) On completion of submission, the candidates shall take a printout of the application and Store it for future use. Candidates should not post the printout of the application to AP LPCET office. iv) After submission of online application if any corrections is noticed the candidates should make the corrections regarding their particulars i.e., Candidate Name, Father’s Name, Date of Birth, Caste, Gender etc. in the nominal roll only at the examination centre. Complaints relating to photographs will be not entertained. The candidates are informed to upload correct information in the online application. No corrections will be entertained after submission of online application. Fee once remitted shall not be refunded under any circumstances.